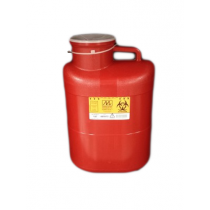 Sharps Container, also known as a sharps disposal, is a container that is used in a variety of fields, though most often in the medical field. You may select a sharps container to properly dispose of medical needles or other sharp instruments. It is standard procedure in the medical field to promptly place medical needles into a sharps disposal after single use. You may drop needles into a sharps container without touching the outside of the container. In fact, you should never push or force sharps or needles into a sharps container. After a sharps container is full, you will need to have your container delivered to a medical waste management site. However, we offer several different containers that include a prepaid shipping box, such as 1 Gallon Sharps Container, 2 Gallon Sharps Container, and 3 Gallon Sharps Container, to safely dispose of your medical needles and sharps without hassle. To easily be identifiable, specifically in the United States, a sharps container is made of a durable, red plastic. In other countries, a sharps disposal may be identified by a durable, yellow plastic container. In the United States, sharps container regulations vary from state to state, so please check with your local regulations to determine the best method of disposal.